Originally appearing on the later 20 back cards as the first of many Star Wars send away offers, this figure's first carded appearance was on the Star Wars 21 back card. During the Return Of The Jedi 65 back releases, the image on this figure's card was replaced with a new image and stayed as such on every card printed until the Droids card, where again a new image ?this time a drawing- replaced the previous image. Though known examples indicate that the switch took place during the 65C production run, It is possible that earlier examples could exist. The original photo made its last appearance on the Return Of The Jedi 65C back. Note that the distinction of 65D and 65E cards is the Anakin figure offer stickers, the 65C was the last printed 65 back variation. Comments: Hard to believe that ten years ago this bad boy would only have cost a collector a few hundred dollars to own carded. It seems that everyone who has joined the vintage collecting community in the last decade insists on owning Boba Fett. Dude may have only had twenty-seven spoken words in the original Star Wars Trilogy, but clearly, considering the fact that up until May 19, 2002 no one knew he was a little clone boy so terribly scarred by the brutal death of his father that he was left with little choice but to become him (talk about denial! ), they must have been the right twenty-seven words? Does that justify the popularity of the bounty hunter? Who cares, he looks cool! Major Variations: Though all vintage figures have minor variations, the Boba Fett figure has one major variation that is highly sought after, that being the Tri-logo version. The sculpt itself is basically the same, minus the lack of a COO* stamp, but it is molded in a very light blue plastic and often this figure is mistaken to be white. There are four minor variations in the Tri-logo Boba Fett but none is too significant for the casual collector. Thus far the Tri-logo version of Boba Fett has only been documented on European cards. 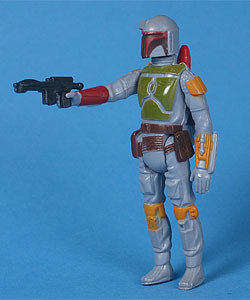 The common version of Boba Fett, which also has a few minor variations in sculpt and spray opts, is not rare in the least, having been available for virtually the entire vintage run, including the Droids line. Boba Fett the A-wing Pilot were the only two figures that made the leap from the basic Star Wars line to the animated line; neither figure was altered in anyway save packaging. This figure was originally intended to feature a rocket-firing action, but due to excessive safety measures, Kenner decided to drop the feature, but only after many months of development. The first version was a kit-bashed figure using parts from other Star Wars action figures and was used in the original photography for the send away figure on the 20 back cards and for the photo insert card of the first release of the Star Wars vinyl collector?s case. Interestingly enough, while the kit-bashed Fett was replaced quickly with an image of the production figure, the 20 back cards featuring the send away offer used simple black stickers or a yellow sticker with a black starburst to cover over the incorrect image. The Canadian version of the Boba Fett offer, on the other hand, did sport a sticker with a photo of what would become the mass-released figure. Kenner was still working on the Rocket Firing feature when they resculpted the figure into the well-known form released, and as such, there are a couple differnet versions of prototypes out there. 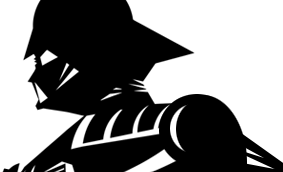 The first, and hardest to fake (though it is still known to be done), is the ?L? slot Fett (pictured above), which does not have COO* or date stamps anywhere on it, and in almost every case, was completely unpainted. The rocket that came with this figure (not shown) is unique to this version in that it only had four risen ridges going up it as opposed to the eight sculpted on the production rocket. Kenner?s second attempt was the ?J? hook version, which unlike the ?L? slot figure, did have both COO and date stamps and most examples found were painted exactly like the production version. It was designed to have the eight-ridged rocket that was later used in (and sonic welded into) the production figure. Because of all this, the ?J? hook Fett is all too easy to fabricate. *COO is the commonly used term for ?Country Of Origin?, which refers to the stamp usually spotted on a figure?s leg that states which country it was manufactured in. Text by D. Martin Myatt. Photography by D. Martin Myatt & Philip Wise.